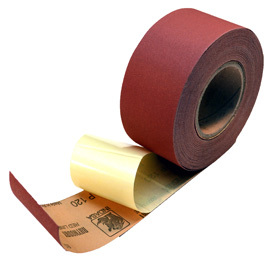 These 2-3/4" wide by 27 yard long abrasive rolls are sized for use on hand sanding blocks or file boards. Note that our rolls a 2 yard longer than the common 25 yard rolls. The material is a C weight aluminum oxide paper with adhesive back and parting sheet.